Last weekend was the first weekend in awhile that Mike and I didn't have a lot going on. 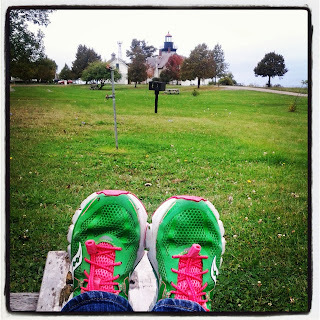 Other than our last 20 mile training run for the MDI Marathon, our weekend was free to do whatever we wanted. Which primarily consisted of sitting on the couch and watching shows. This weekend, was not quite like that. We were back to having lots of plans, and even though that means we are busy I don't mind since we are having fun too! 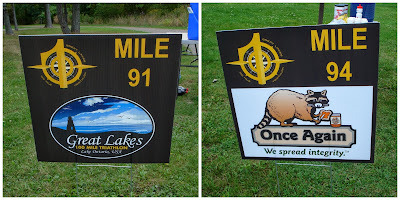 Yesterday Mike and I went back to Barker, New York (about an hour away from Rochester along Lake Ontario) to volunteer for the Great Lakes 100 Mile Triathlon for the second year in a row. 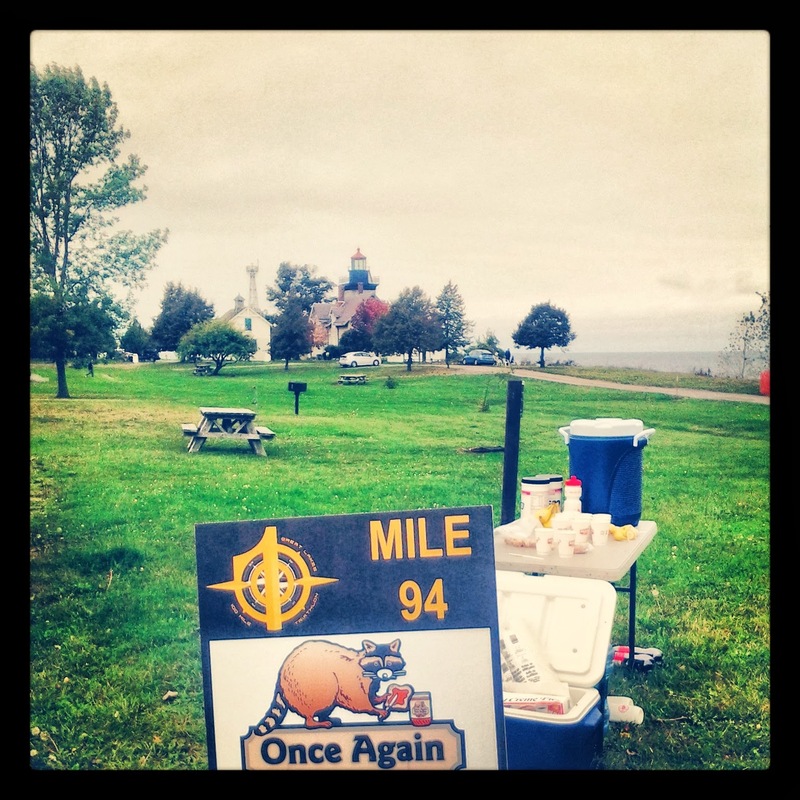 Last year we volunteered at the inaugural race and had a blast! We are planning on racing at the Lake Erie venue next June. This year Mike and I were assigned to miles 6 and 9 on the run course (it is a 15 mile out and back). The swim had been canceled this year so the athletes had to do a 1 mile trail run (instead of the 1 mile swim), an 84 mile bike and a 15 mile run. We arrived around 10:30am to check in and then went to our assigned location. The night before I had been doing some last minute stuff to get ready to volunteer and I realized that we were assigned right near the lighthouse! 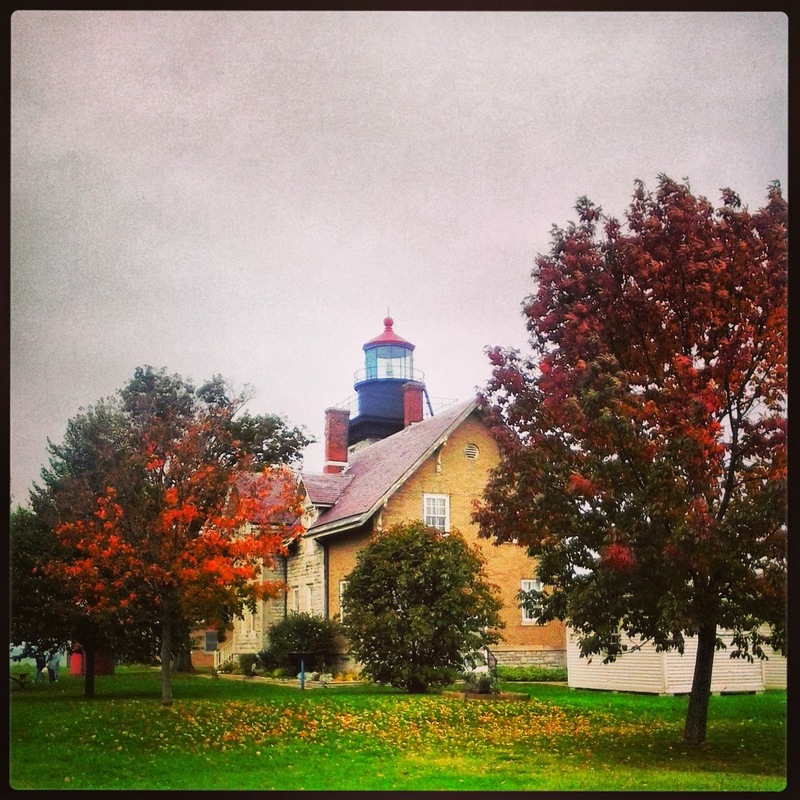 The run course takes you into Golden Hill State Park and Thirty Mile Point lighthouse is one of the main features of the park. 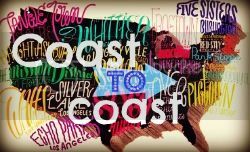 We chatted with the race director and the run course captain while they were setting up our tables, and told them that we plan on racing in Ohio next year! We had a while before the first person showed up, he didn't come in until almost 12:40pm, so we just sat around waiting. The weather was a little bit better this year compared to last year, but it was still pretty windy. We saw a few friends that were racing and cheered them on. One person is a DailyMile friend and she didn't recognize us at first. After Mike cheered her on using her name, she said, "how do you know my name?" It provided a good laugh after she realized who we were! The best part, other than the fact that we love volunteering, was the one guy who said, "I love you guys!" after we told him that we had chicken broth at our table. 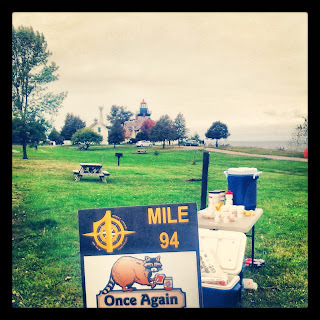 We ended up volunteering until 6pm because the last person didn't come through mile 6 on the run course until 5:10pm. We almost left because it had been awhile since we were told the description of the last competitor, but then as we were driving out of the park we saw her in the distance and turned around. She was so appreciative that it made us feel good, and we felt even better while driving back to the camp to get food and we saw that most of the final aid stations didn't have volunteers there anymore (though water cups, food, etc. were still out). After getting home around 8pm, we enjoyed some Dairy Queen and watched a few shows before going to bed. Today, Mike and I ran a hilly 12 mile route. It went pretty well, but the humidity and the fact that we had been standing almost all day yesterday didn't help much. I handled most of the hills pretty well and I am getting really excited for the MDI Marathon! After Mike and I had plans to meet up with Sarah and her family to go apple picking. 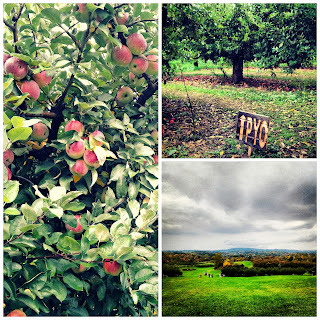 We had fun catching up with them, picking apples, eating apple cider donuts and macaroni and cheese (there was a food truck right outside of the apple farm). Here's the proof that we were all together! All in all it was a wonderful weekend, and it's not over yet since we are going to be heading over to Amber and Greg's house soon for some more running talk and food! (And football for those that care about it, ha). Boo! Hopefully you still get to do something fall-like! You and Mike are so amazing. 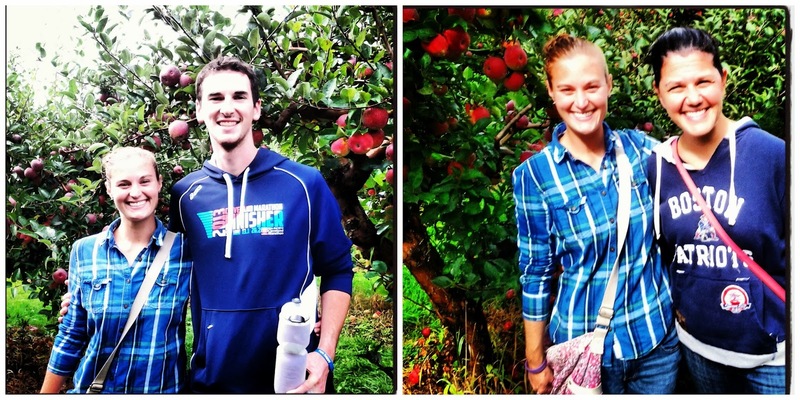 Not only are you perhaps the most dedicated runners/triathletes I know, but you two give back so much. Aww, thank you so much Abby! We love to volunteer, we're actually volunteering again next weekend! It's cool that you guys volunteer at races as well as running them yourselves. The volunteers are always one of the most important parts of a race and I always try to say thanks! Happy running! That sounds like the perfect weekend! I love that you turned around to be there for the last runner--you guys are awesome!! What a beauuuuutiful spot to be assigned to! 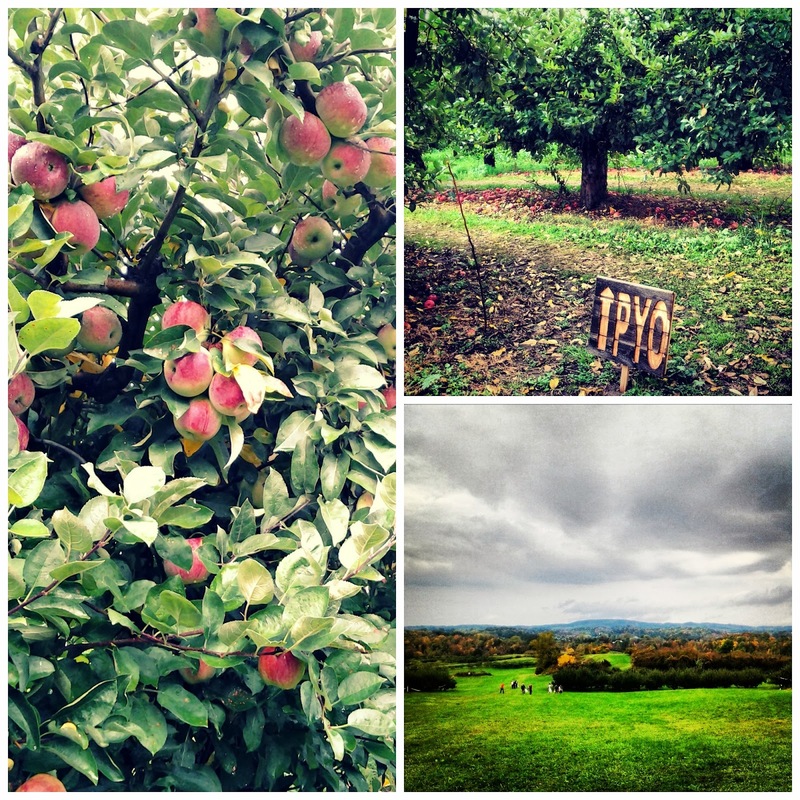 And to top the weekend off with some lovely apple-picking is always a plus! Wow, busy weekend! So fun that you got to volunteer again! It's really humid here, too. Where did fall go? That sounds like an awesome time! You can *never* go wrong with apple cider donuts.